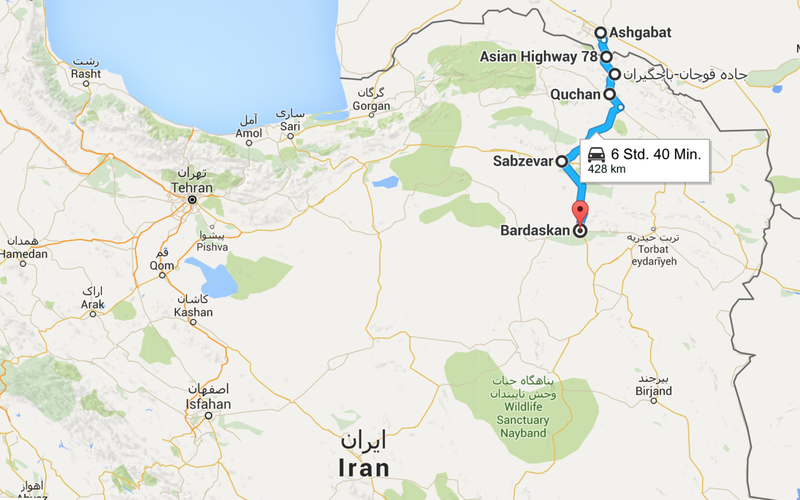 13 – 24 October, 2015 – Getting through customs and to Iran was easy. Between the two borders I dressed up and replaced short trousers by long trousers, T-Shirt by long-sleeved tunic and wrapped a beige scarf around my head. Once our visas were checked and stamped the customs officers who had to check our luggage welcomed us, chatted a while with us and let us through without checking anything. 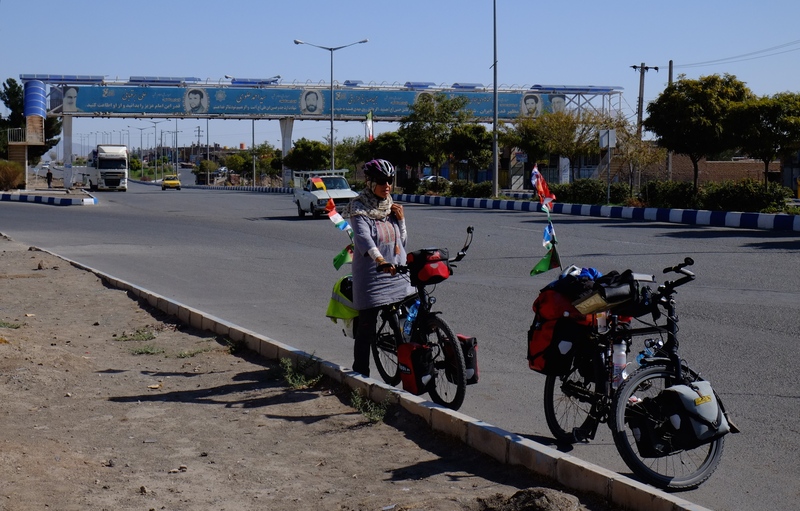 After five strange days in a little welcoming country we were now very anxious to experience Iranian hospitality we’ve heard so much about. 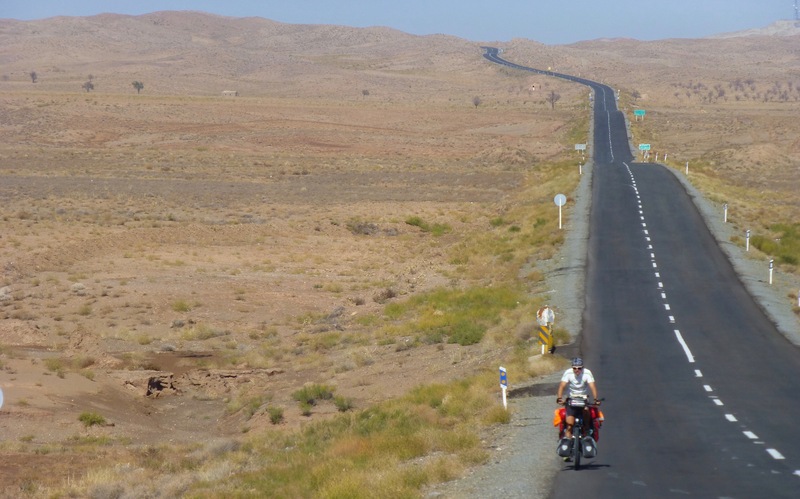 But first we had to cycle through barren mountainous and remote landscapes where we would hardly meet a soul. 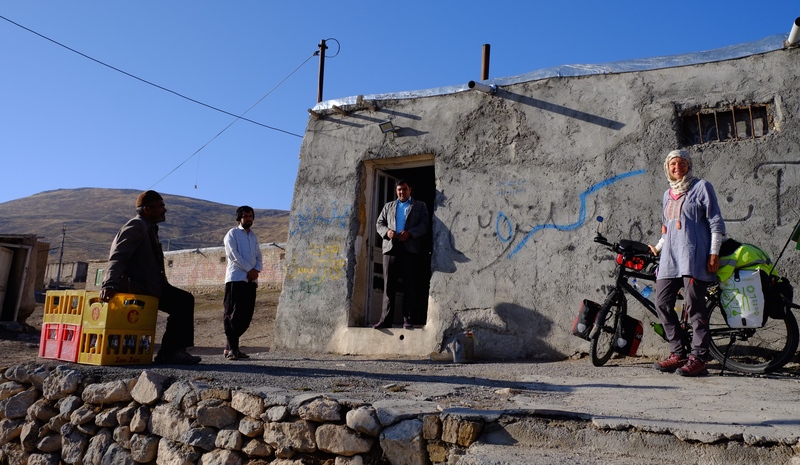 At the end of the first day in Iran we stopped at a small and desolate village to find a place to sleep but only succeeded after almost an hour. A shop owner let us sleep in his storage room that strongly smelled of gasoline. We continued early the following morning still having the smell of gasoline in our noses. 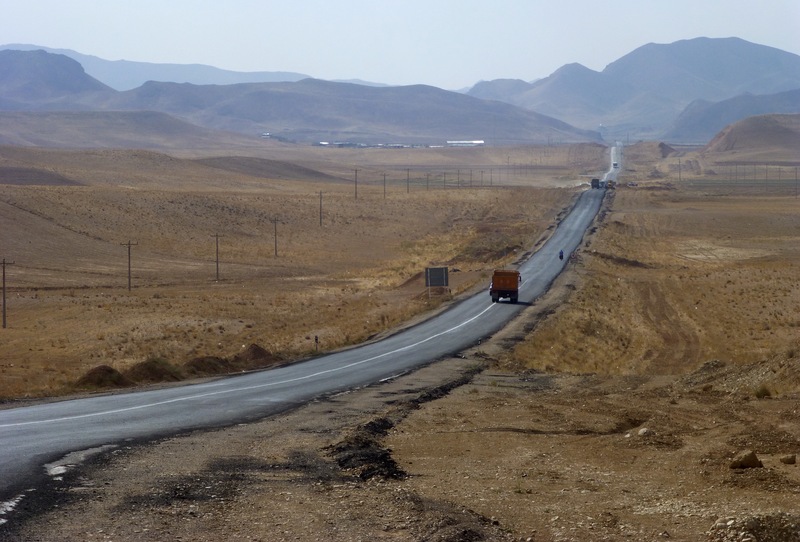 Traffic had picked up quite a bit as we were now on one of the main transit routes for trucks between Turkey and Turkmenistan. After all these quiet roads we still needed to get used to heavy traffic. 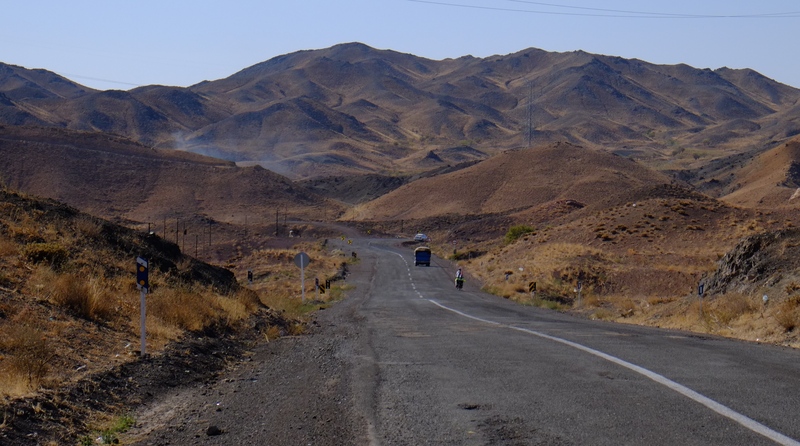 Arriving in Quchan, our first town in Iran, felt bizarre. 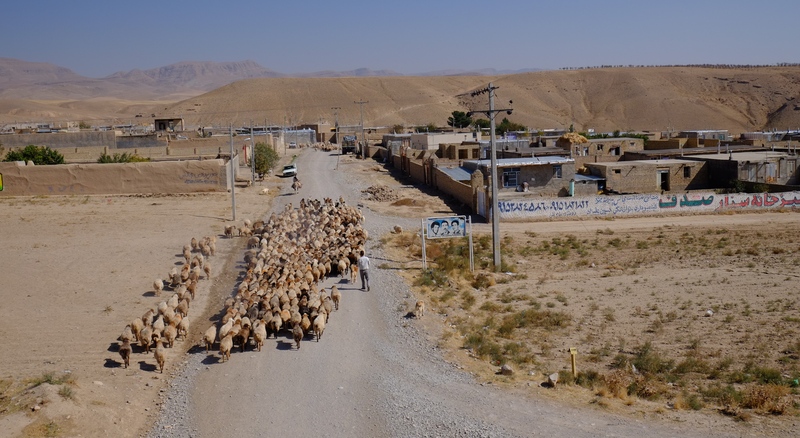 We hadn’t seen any Iranian women so far and suddenly the town was crowded with women dressed in their black Chadors – a huge piece of fabric wrapped around them. People were staring at us, I think not many tourists have ever passed this town. Whenever somebody could speak some English, that person would approach us and ask if they could help. 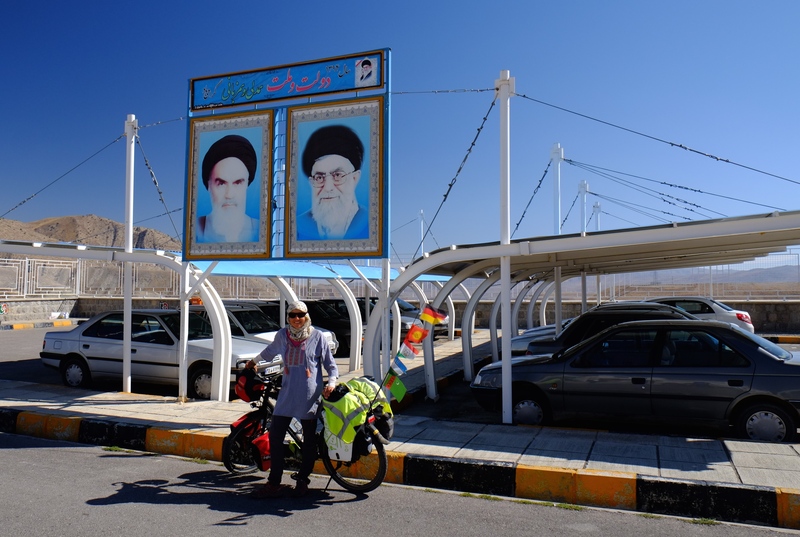 A nice couple even helped us with buying me a new cycling outfit and accompanied us to many different shops until I found something suitable for Iran. I still felt a little awkward in my now even more colorful new clothes but they confirmed that there was no need for me to wear black as all Iranian women. In fact she told me that she would wear dark colours only at official occasions and for work. I was relieved as I didn’t want to get arrested by the moral police for non-conformal attire. 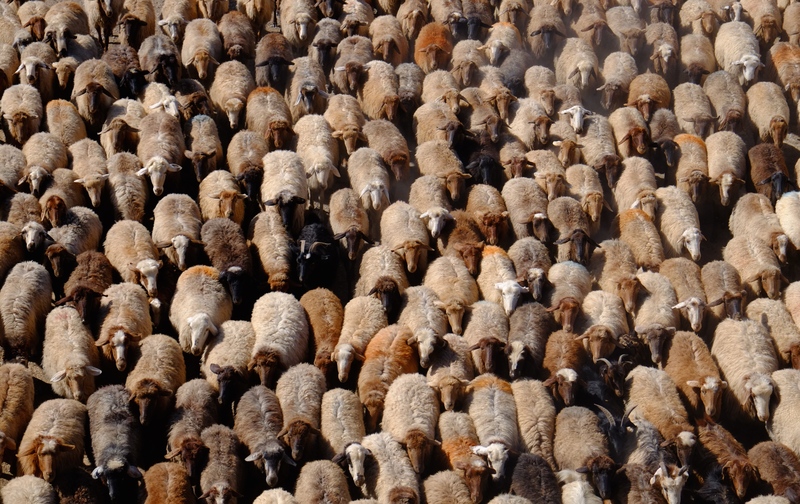 Where is the black sheep or is it even a goat? A woman – finally! 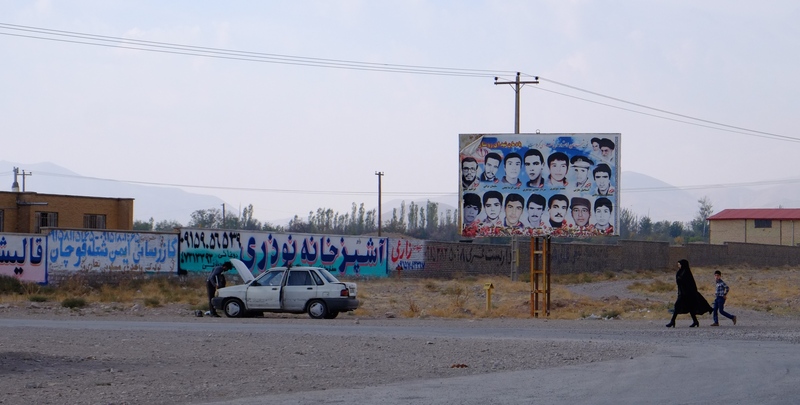 And a billboard with men that died during the Iran/Irak war. 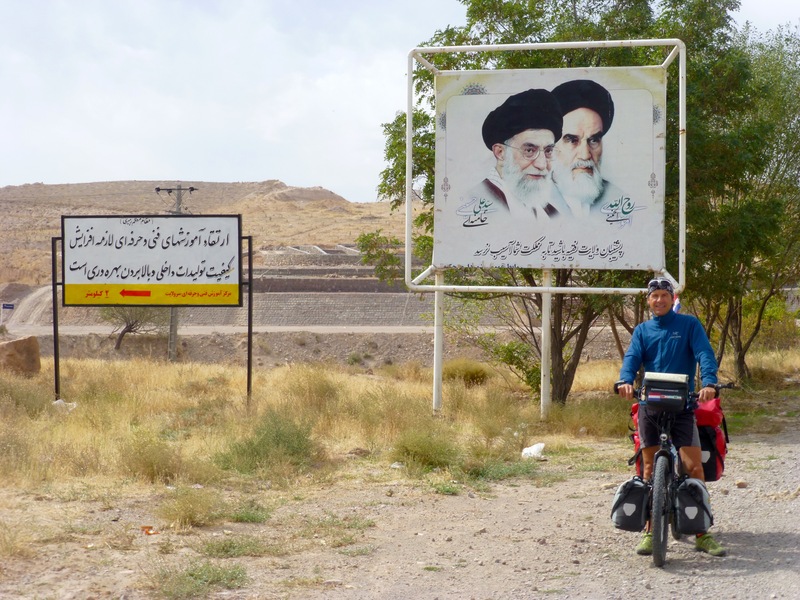 You will find these pictures at the entrance of every village and town in Iran. It was more difficult for me to get used to the scarf and it happened more than once that my scarf went loose and I often only noticed when I saw people laughing about my clumsiness. That reaction also made me feel much more comfortable in my attire, knowing that most Iranians didn’t care too much about what I was wearing. And covering up also has its advantages: I saved a lot on sunscreen and bad-hair-days belonged to the past, even better, my hair wouldn’t get as filthy anymore from the truck and car exhaust, so I was also saving on shampoo. What we definitely couldn’t get used to was the sudden lack of free access to information. Not only were our Facebook and Blog websites no longer accessible for us, most Western news sites were suddenly blocked after we went there more than once. Internet was slow and at times non-existing, even in big cities. Everything is controlled by the government in this country. 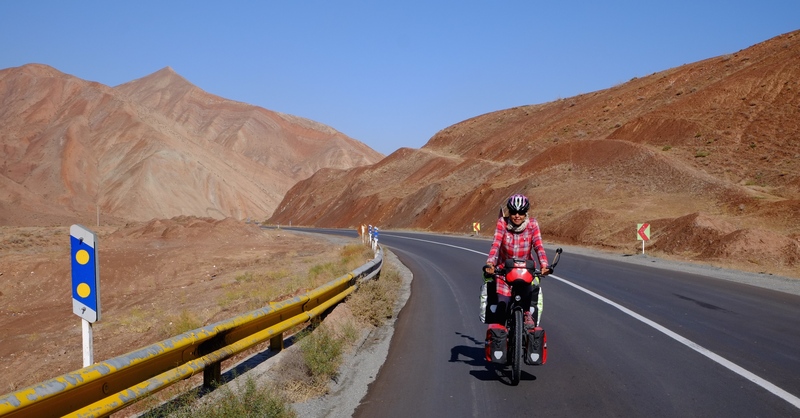 We were now cycling in the direction of the Iranian desert but still had to overcome a few mountains and passes. 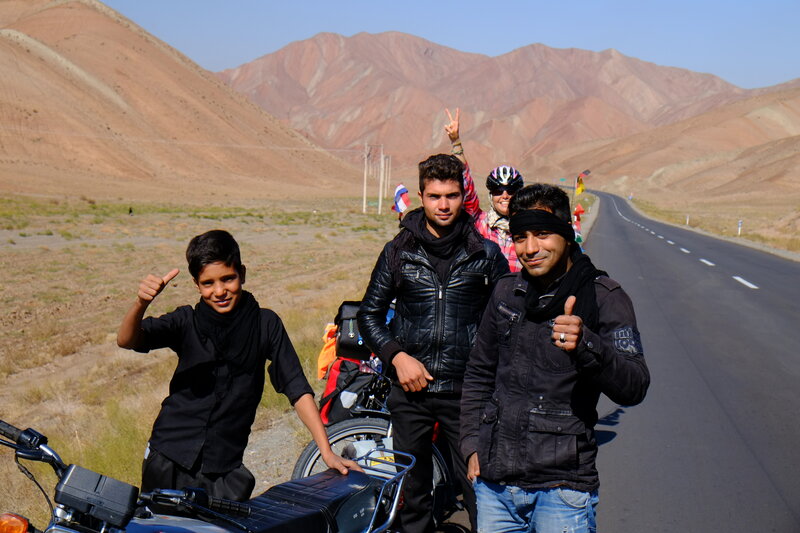 Until now we were still waiting for the so famous Iranian hospitality, so far we hadn’t noticed any difference to Central Asian or Southeast Asian countries. But that would change almost immediately. We were cycling uphill and – surprise, surprise – with a very cold wind in our backs. At the police control at the top of a hill we were treated with hot tea and later at a village the local English teacher would invite us to stay at his home for the night. We declined, as we wanted to benefit from the tailwind and the downhills knowing our luck with this element. 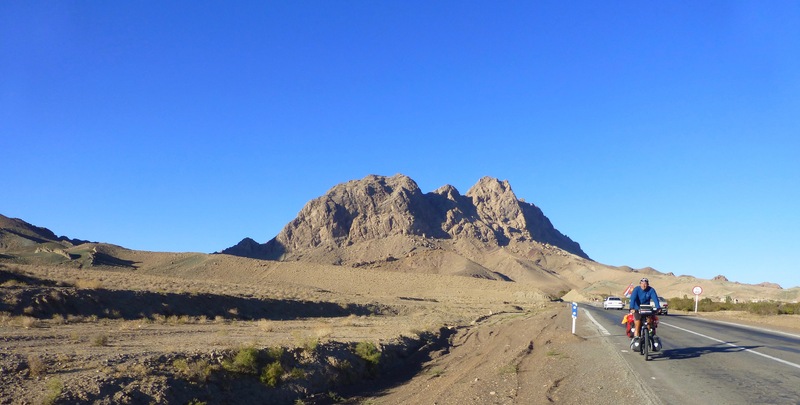 The landscape reminded us a lot on Kyrgyzstan with its rugged mountains and sparse vegetation around us. 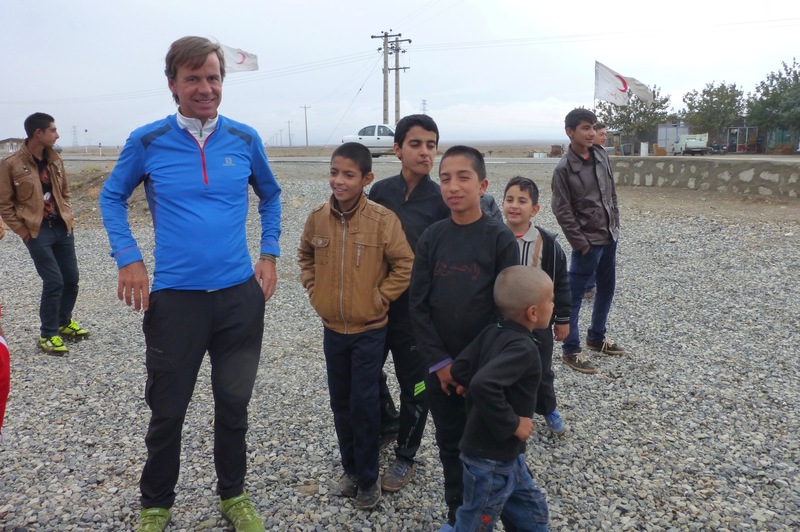 Around 10km before our final stop for the day – dusk was around – a police car turned up, escorted us into town and showed us a truck stop where we could sleep for free and enjoy the Iranian staple food chicken kebab. That night it rained heavily and we were happy we weren’t sleeping in our tent. 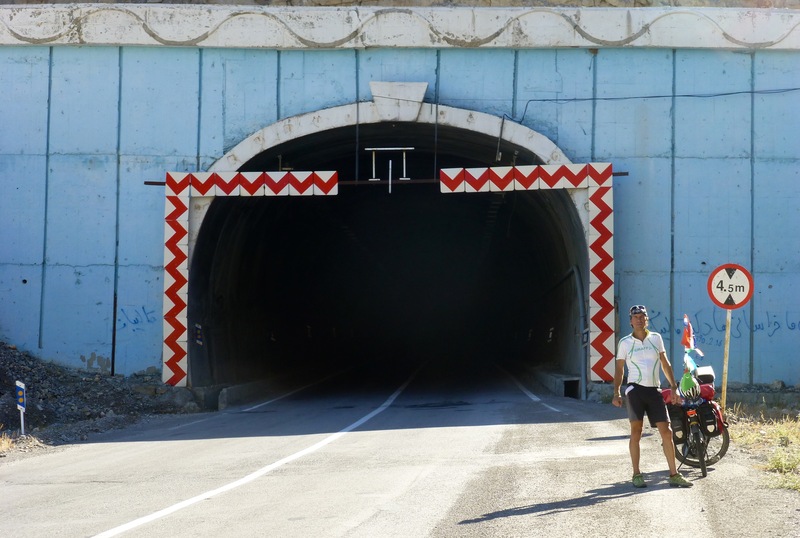 We were now looking forward to our first real rest day in Sabzevar in a while – but first we had to cross another pass with tired legs and Johan not feeling well. Again we were rewarded by beautiful weather and stunning rugged landscapes. Traffic continued picking up tremendously after the pass which I didn’t like too much and Johan didn’t mind at all. Our rest day in Sabzevar turned out to become a rest week – at least for me – as Johan got the flu and stayed most of the time in bed trying to recover. The day we could finally move on again it rained. We left anyhow, we couldn’t wait riding our bikes again. So far we hadn’t gotten a real feel for Iran staying in hotels most of the time. Not only did it rain, we also had to cycle against the wind. Not a good start for a long cycling day. Within no time the rain got worse and the temperature dropped. At lunchtime we luckily reached a village and knocked at the door of the Red Crescent facilities to ask if we could eat inside to get warm and dry. 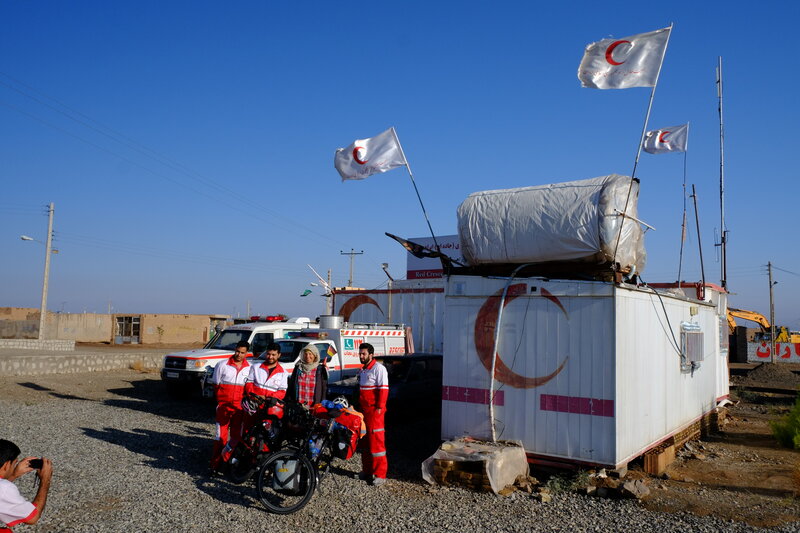 We were welcomed by four young guys in Red Crescent uniforms and seated on the ground in front of the heating. Of course we were not allowed to unpack our lunch and instead ate Dizi after the Iranian table – a square plastic tablecloth – was set on the ground. As the rain and wind just continued they invited us to sleep at their facilities and we happily accepted. We both weren’t keen on cycling in the rain and even less on camping in the rain. 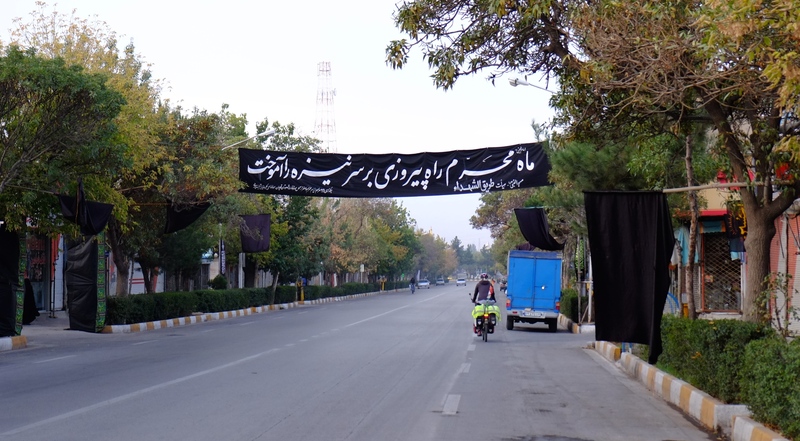 It also happened to be the first day of the 10-day-long Imam Hossein mourning ceremonies and in the late afternoon a few villagers accompanied by an English teacher visiting her family for the celebrations came by to have tea with us and ask us all kinds of questions, e.g. if we had problems with using the Iranian squat toilets. They invited us to join their celebrations at the mosque and we again happily accepted. We went by car to the mosque that was around 200m away. I then went with the English teacher to the women’s mosque and Johan continued with the men. Before we entered the mosque, I got introduced to the about 100 women already sitting in a huge hall along the walls. 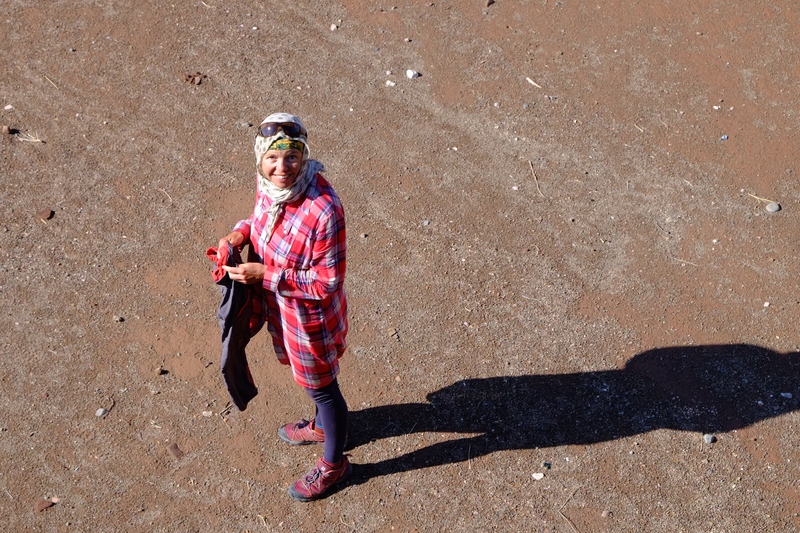 Everybody was curiously looking at this stranger in even stranger colourful clothes. 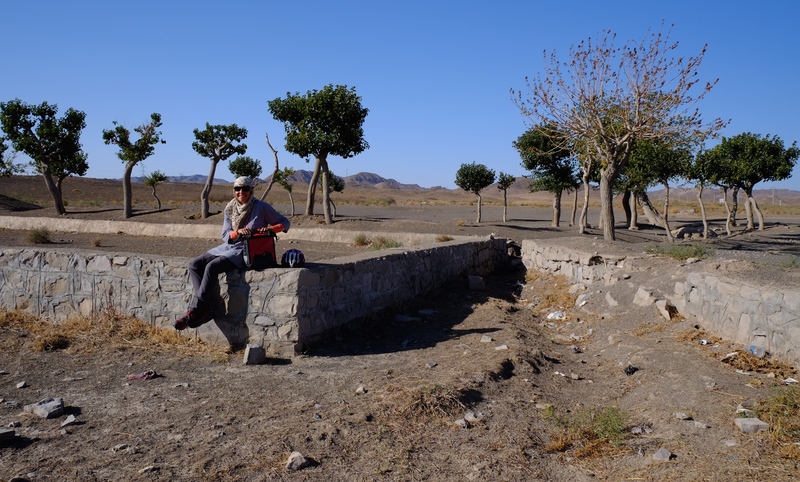 We sat down as well and shortly after the Iranian table was laid out once more, dinner was served: bread with yoghurt, Dizi again, which is a greasy soup where you soak in bread crumbs and later add sheep meet and vegetables. The women couldn’t stop looking and smiling at me, and telling me how happy they were that I was joining them. After what I thought was a short prayer by one woman and a reply by all the other women, everybody stood up – to first take a photo with me – and then to leave. Within one hour we had eaten and the celebrations were over – only to be continued over the coming ten days. I was a bit disappointed as I earlier saw processions on TV where men dressed in black chastised themselves. I thought similar things would happen here. When I met Johan later again, not much more happened in the men’s mosque. The two well-known guys again! The following morning we left after a long photo session at chilly temperatures and of course against the wind. At least the rain had stopped. 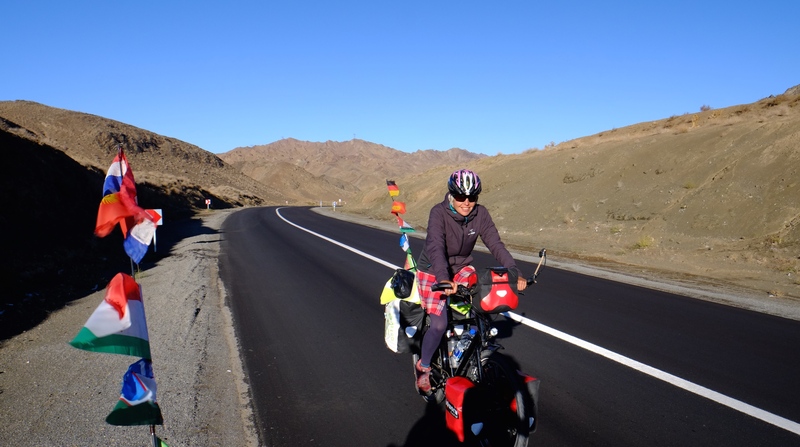 We were heading into the mountains and were climbing until after 3pm before we could start our fast descend – we only had little time left before nightfall for the remaining 40km, but with a strong tailwind and a continuous downhill we managed easily. Each time we stopped for a break, a car would stop and people would give us food. 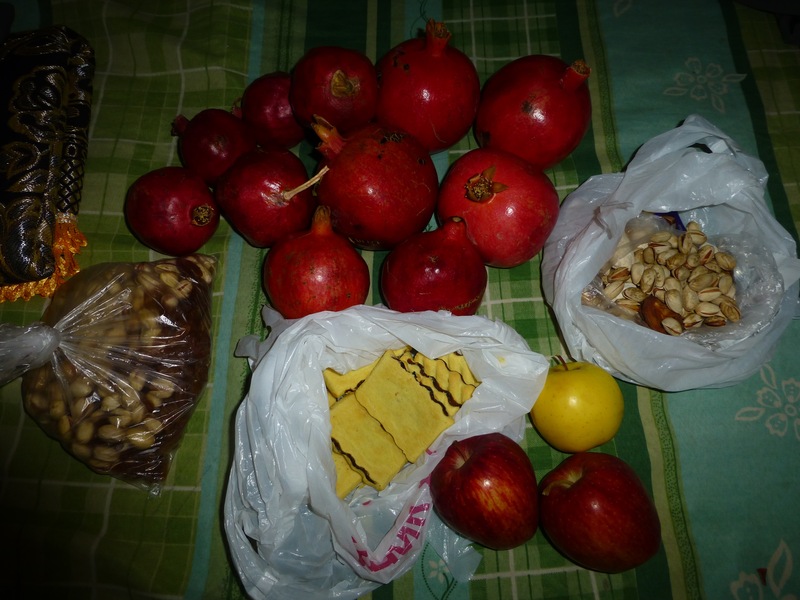 By the end of the day we had collected ten pomegranates, three apples, two cucumbers, one rice pudding dessert, three bags full of pistachios, chocolate, four tangerines, special cookies from Kashmar and other cookies. We finally got a feel for Iranian hospitality. We stayed for free at a mosque in Bardeskan where we had our own room with a bed and could make use of a shared bathroom including shower. We were just preparing our dinner when we heard a knock on our door and a few locals who earlier showed us to this mosque gave us another box of cookies and invited us to their home for a tea. 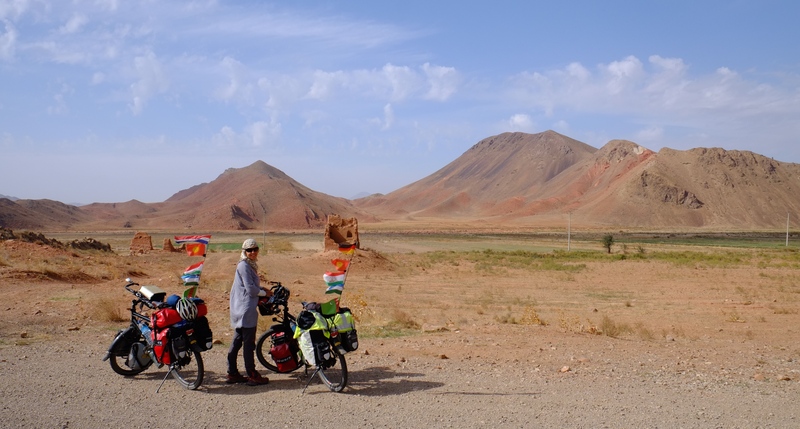 We declined with a bad conscience but we were keen on going to bed early as another long cycling day laid ahead. …and finally and happily descending. I am so enjoying reading about your travels! Wow! Great blog. 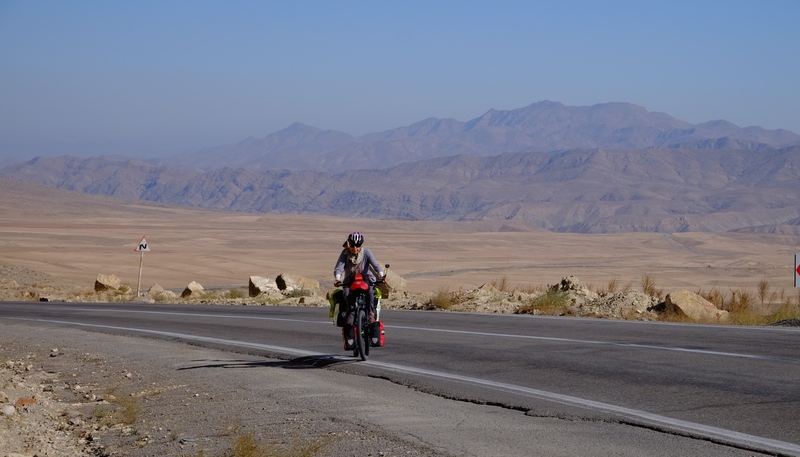 My girlfriend and I are hoping to cycle towards Iran but have not found any other blogs of people doing it. We’ll keep an eye on the blog with great interest.